Since I started using Lightroom (learn what Lightroom is), I have migrated my Lightroom catalog at least four times. Today, I offer you my methodical, step by step approach. First, I do not treat my Lightroom setup as a monolith installation; it is more like a multi-piece entity with its parts scattered across different corners of my computer. I keep my Lightroom installation with the master catalog, configuration files, and previews on my primary SSD (solid state drive) hard drive. It is extremely fast but relatively small at only 500 GB. This means that I cannot store my entire photo library (a total of 5 TB) next to my master catalog. I have a conventional hard drive (8 TB) dedicated to my photo library. 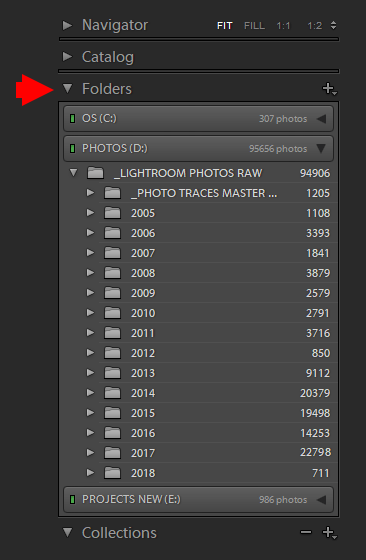 Finally, I keep my Lightroom catalog backups on a separate hard drive where I store all my archived files and the resources I do not use on a regular basis. 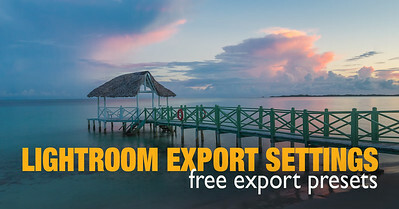 I treat the process of migrating Lightroom to a new computer as a multistep process where I address the different parts of the Lightroom setup separately. The process of migrating Lightroom to a new computer can be broken down into seven components, two of which are optional. When you address each component separately, the whole process becomes very logical and uncomplicated. 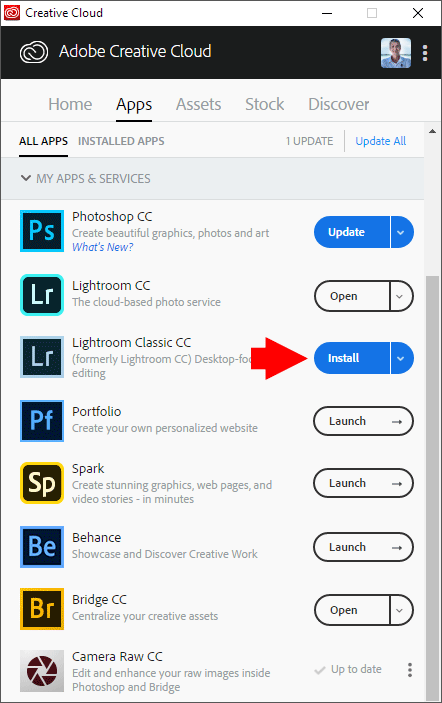 Before you can install Lightroom, you must install the Creative Cloud application on your new computer. After installing the Creative Cloud app, you must authenticate it using your Creative Cloud credentials. Next, deploy Lightroom by triggering the installation from the Creative Cloud app. As you probably know, Creative Cloud allows you to install Lightroom to two different computers (Mac and PC). 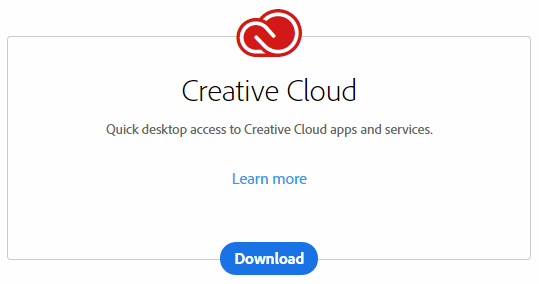 If you have already installed and activated Lightroom on two computers, you must go to the Creative Cloud web portal (Plans & Products tab) and disconnect one of your installations. TIP: Make sure that you do not disconnect the computer from which you are currently performing the migration. You will need to access it multiple times throughout the migration process. In my case, I have Lightroom activated on my desktop and on my travel laptop. When I start the migration process, I deactivate my laptop installation so that I can use Lightroom on my old and new computers during the migration. Before you start moving your photo library to a new computer, make sure it is well organized. I have a dedicated tutorial where I outline my Lightroom photo organization and library structure that I use in my photography. The idea behind library organization is based on the concept of having all your image files stored in a single location under the umbrella of the master directory. This organization style makes it incredibly simple to back up your photos. It also makes it easy to move your entire library from one location to another. If your photos are scattered across different drives and directories, you will have a hard time managing your library. Before starting the migration, I strongly recommend that you conform your photo library into a one-directory structure. TIP: Make sure to organize your library from within Lightroom using the Folders Panel in the Library Module. If you use Explorer (Win) or Finder (Mac) to move your image files around, Lightroom will not be able to track these changes. Once your library is in order, use an external hard drive to copy your entire library to your new computer. The next step is to move the catalog file to a new computer. The Lightroom Catalog is a database where the application stores the information about the photos and their organization. It is not always easy to locate a catalog file because, sometimes, it is buried deep inside your computer’s installation folders. Fortunately, Lightroom provides us with a shortcut to an active catalog location. From the top menu, select EDIT (Lightroom on Mac) > Catalog Settings… Go to the General tab and click the SHOW button. 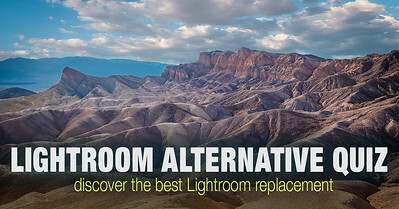 This will take you to the directory where the Lightroom catalog resides. You will need to copy the catalog file to your new computer. I highly recommend that you keep your catalog file on your fastest drive, preferably on a solid state drive (SSD). 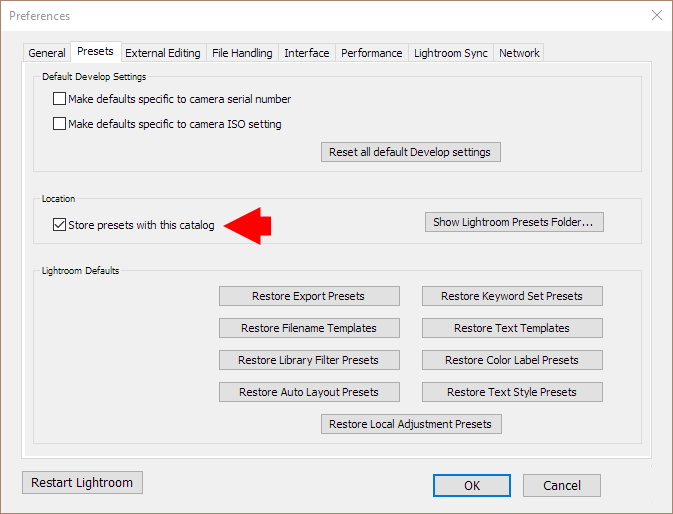 Lightroom combines all the settings, configuration files and presets under the Lightroom Settings directory. The directory contains a massive amount of information related to your Lightroom Catalog. It stores all the develop presets, import and export presets, metadata presets, keyword sets and so forth. If you do not import all the configuration information to your new installation, it can take weeks or even months to recreate it. Importing the directory is an essential step of the migrating process. Depending on your preferences, the Lightroom Settings directory can be located in the catalog directory or in the Lightroom installation folder. Use Location checkbox in Lightroom Preferences to store Lightroom Settings in the Catalog Folder. In my case, I use one catalog organization and prefer to store all my configuration files and presets next to my catalog file. This helps me localize all catalog related data in a single location, but it also means that the settings and presets cannot be shared across multiple catalogs. You must copy the entire Lightroom Settings folder to a new computer and place them in a new catalog folder or a new Lightroom installation directory. When you have completed the four previous steps, you are ready to launch your imported Lightroom Catalog on a new computer. The chance that the file structure on your new machine is identical to your old one is very slim. This means that Lightroom won’t be able to find your photos because they are stored in a different location. 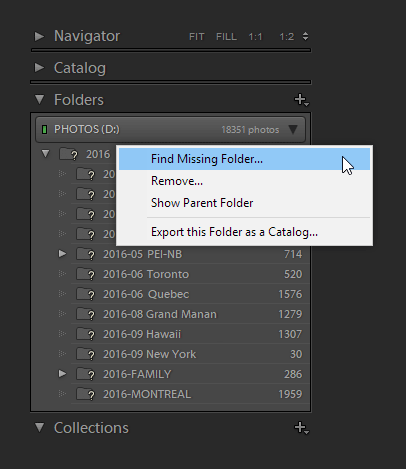 When you see a question mark next to a folder inside the Lightroom Library module, this means that it has no idea where to find them and that you need to re-link the missing folders to point them to a new image location. The good news is that you do not have to do this for every folder. All you have to do is right click at the top of the parent folder and point to the new location where you placed the photo library in Step 2. 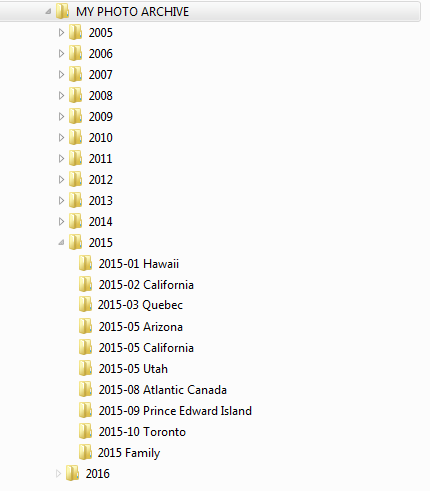 Lightroom will do the rest by mapping all the folders to their new locations. The way Lightroom works is that for each photo you import, to catalog it creates a preview file(s) or a JPEG version of your original image. Depending on your preferences, Lightroom might create a full-size JPEG version of your RAW file plus a smaller version if you use Smart Previews functionality. 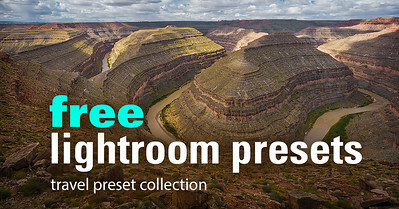 The preview files are an essential part of Lightroom’s non-destructive RAW workflow. I know that many photographers copy their original preview files to a new computer, but I never do. In Lightroom Preferences, you can specify how long you want to keep full-size previews before they are discarded. Because of the limited disk space on my primary SSD drive, I use the 30-day option. This means that if I do not use a particular image for longer than 30 days, Lightroom discards its preview. 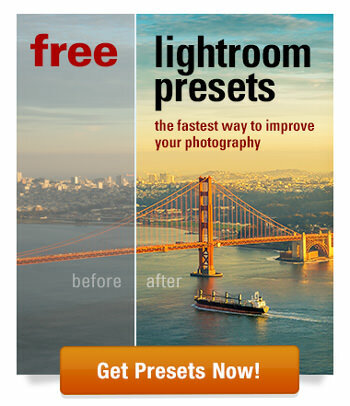 But, I find that Lightroom does not manage this option very well. Over a period of months, the preview folder size grows out of control and I have to manually delete the previews to recover valuable disk space. The migration process gives me an opportunity to start the preview generation process from scratch without importing any unnecessary files. When I am finished with the migration, I can begin recreating preview files as I need them by using the manual method in Library Module. Since Lightroom stores the Catalog, Settings and Previews inside the catalog folder, it makes sense to combine steps 3, 4 and 5 into a single move by copying the entire catalog folder with all its content to a new computer. 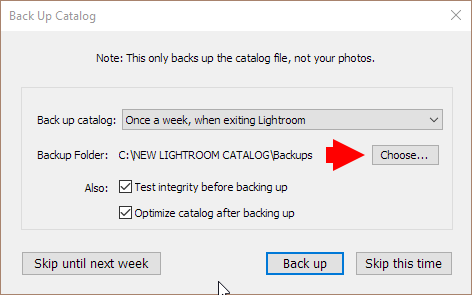 Lightroom has a built-in functionality to back up the catalog files in case the master catalog is corrupt. This is a very critical functionality because the catalog files contain years of accumulated information. If you lose it, it will be a disaster. In my case, the backup process is set to a weekly schedule. However, you can configure it to a different frequency. By default, Lightroom stores catalog backup files inside the Catalog folder. But, it is highly recommended that you use a different location from your master drive where the catalog resides. The logic here is that if your master drive fails, you will have a backup that is intact on another drive. While it is recommended that you import backup files to a new installation, it is not critical. In the 12 years that I have used Lightroom, I have never had any issues with catalog files so I am not very paranoid in this regard. When I complete the migration process and everything looks good, I create the first backup on a new computer and this is more than enough for me. Plus, I always have a few versions of the catalog backup saved on my Backblaze cloud. 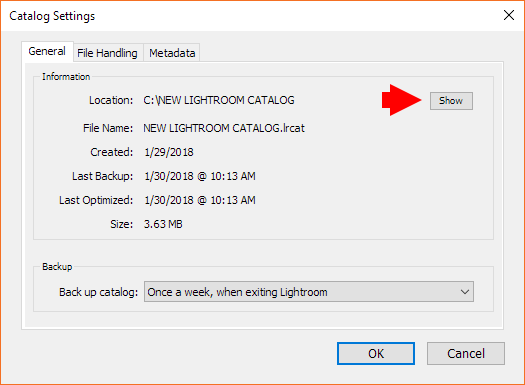 Moving the Lightroom Catalog to a new location is a serious undertaking and can be a disastrous experience if done wrong. But, if you follow the outlined steps, the process will be painless and can be completed in no time at all! Viktor, thanks so much for this very informative and timely article! I just bought a new PC and this is just what I needed. you are welcome. It took me years to streamline it. Thank-you so much! This is the best content for moving the library and setting up Lightroom on a new computer. Up-to-date, thorough, and exceptionally well-written. Thank you so much! 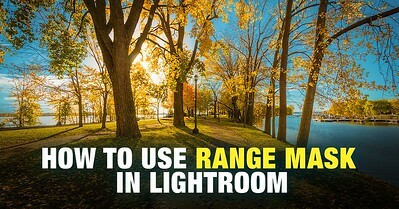 This tutorial helped me a lot to move my Lightroom do another computer. Alex, no renaming is needed. Simply point the Lightroom to the new folder location. It all worked great thanks to your help, I am up and running. You suggested LR will run faster if the Catalog is on the smaller solid-state drive (C:). should I just move the Lightroom directory from D: to C:, or there is something more complicated to do? The Lightroom will convert your old Catalog to a new format. It is fully automated. But I recommend making a copy of the old catalog anyway.